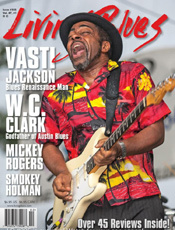 Grammy-Nominated Mississippi Delta Bluesman VASTI JACKSON! This is a VERY SPECIAL SHOW. YOU DO NOT WANT TO MISS the chance to see such an incredible performer in such an intimate venue. Vasti will be performing with a full band! Two sets! One night only! World renowned guitarist, and vocalist, Mississippi living blues legend, Cultural ambassador, 2012 Mississippi Musicians Hall of Fame inductee, and 2015 Albert King Lifetime Guitar Award recipient, Vasti Jackson is a powerful force in the world of music! With more than forty three years as a professional musician. As an artist, Vasti is known for sweat-drenched, soul-ripping live performances marked by some of the most stunning, and innovative guitar playing today. Vasti’s stellar vocals, fiery guitar, and stage presence captures the audience, and leaves a lasting impression that celebrates the triumph of the blues, and the joy of rhythm that is soul satisfying to all that are lucky enough to experience his music. Question: What does BB King, The Grammys, Harry Connick, Jr., Martin Scorsese, Wynton Marsalis, Dr. John, and Cassandra Wilson, have in common? Vasti Jackson! Vasti (pronounced Vast-Eye) Jackson is a consummate performer, songwriter, arranger, and producer. From his early beginnings playing in churches, and juke joints in McComb, Mississippi, to festivals, Concerts, and theatres around the world. Vasti move effortlessly from Blues to Soul to Jazz to Funk to gospel to pop, and beyond.